This Saturday, readers in the palm beaches awoke to an edition of The Palm Beach Post with a story about our on-the-spectrum film critics on the front page of its Accent section. 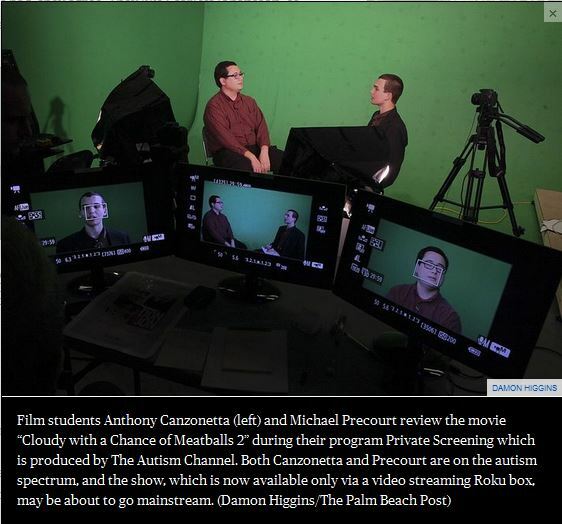 In front of a green-screen set in a West Palm Beach TV studio, movie critics Michael Precourt and Anthony Canzonetta are dissecting “Don Jon,” Joseph Gorden-Levitt’s racy directorial debut. The acting? Not bad, they agree. They like Scarlett Johansson, of course. They’re 20-something males. Directing and script? A solid effort. Their specialized audience understands the coded shorthand. The film has a high potential to cause sensory overload in people on the autism spectrum. People like Precourt and Canzonetta. “There are flashing lights throughout the movie,” advises Precourt. “Ow, ow, ow and ow,” said Canzonetta, the “Ebert” to Precourt’s “Siskel. “Yeah, don’t go all Baz Lurhmann on us with a bunch of half second clips,” says Precourt, who, like his TV partner, is a student at Florida Atlantic University in Boca Raton. Precourt is a film major; Canzonetta is pre-med with a minor in film studies. Also like Canzonetta, Precourt has Asperger’s Syndrome, a form of autism associated with focused interests, high-functioning abilities and difficulties with social skills. Their program is one of dozens streamed weekly from Flying Pig Ranch Studios on Haverhill Road in West Palm Beach, home to The Autism Channel (TAC). Although TAC’s shows are aimed at families with members on the autism spectrum, the channel may be the only network that regularly puts people with autism in front of the camera. Viewing the on-demand video streaming channel requires a $49 to $100 Roku box, although TAC may soon have a new platform on Panasonic smart TVs, Blu-ray players and gaming consoles. Actors playing people with Asperger’s have become a recent TV trend. Diane Kruger in FX’s “The Bridge,” “Parenthood’s” Max Braverman as well as Sheldon Cooper on “The Big Bang Theory” and “Community’s” Abed Nadir are all characters with either stated or assumed autistic personalities. But on TAC, no one’s acting. Daniel Heinlein, the host of the talk show “I Am Autistic,” is a 26-year-old from the Chicago area with Asperger’s. “Rocket Family Chronicles” follows the exploits of a wacky San Francisco family whose most well-adjusted member is an autistic teenager. A couple of cooking and exercise shows have stars or co-stars with autism. A reality program called “At Home With …” profiles families coping with autistic children. In addition, a weekly news show covers the latest news about autism. TAC’s highest rated show is “Time Out,” seven minutes of soothing music and images designed to calm an agitated autistic brain. Trowbridge and his partner, Ray Smithers, are radio news veterans and serial entrepreneurs. In the 1980s, they developed a 1-800 telephone system to help customers locate the nearest Walgreens or Cirrus network ATM. The idea for TAC was born after the men heard a TED talk by Temple Grandin, the Colorado animal science professor and autism activist, who described her thinking process. “Hearing her, both Ray and I realized we’re probably on the spectrum, too,” said Trowbridge, who speaks in rapid-fire bursts. The men, who are business and life partners, sleep during the day and work all night. Trowbridge taught himself the complex programming necessary to stream TAC. Smithers concentrates on programming and production. They sunk “six figures” of their own money into their startup, their gamble bolstered by a near doubling of autism diagnoses among children in the past decade, to one in 88 in 2008, according to the Centers for Disease Control and Prevention. From the start, they decided to put people on the spectrum on their shows. “We had no idea how right we were. We’ve learned that viewership for those shows is off the hook,” said Trowbridge. Autism programming, believes Trowbridge, is ready to go from obscurity to mainstream. Once on the Panasonic platform, which he hopes will happen by the end of the year, he expects 50,000 to 100,000 viewers a day. “That makes us attractive to advertisers, ” he said. The rise of TAC coincides with a radicalized autism rights movement that borrows the language of liberation politics to insist that autism is a variation in function, not a mental disorder needing to be cured. Instead they say, society needs to be cured of its stereotypes about autism. “Auties” and “aspies,” as they call themselves, think in neurodiverse ways, they insist, while the non-autistic are neurotypical. “Nothing about us without us,” says members of autism advocacy groups such as the Autistic Self Advocacy Network and Autism Network International, which demand the right for autistics to define themselves. “It’s groundbreaking in (autistic’s) insistence on validation and that they have something important to say. They can speak for themselves, even if they have to type it,” Scott said. FAU has “40 to 50” students on the autism spectrum, Scott said, many of whom excel because of their ability to focus. Still, autistic kids require high-quality early childhood intervention, Scott said. Movie critic Precourt said he began therapy soon after he was diagnosed at age 3. Sitting in an FAU courtyard outside a campus Starbucks on a sunny afternoon, Precourt speaks loudly in pronouncements, rather than the give-and-take of conversation. At his mother’s suggestion, the Orlando native stopped by the TAC studios last summer to discuss doing movie reviews and walked out with his own show. “We screen-tested him and he jumped off the screen,” said Smithers. A member of FAU’s community council and the publicity committee for his dorm, which presents dances and barbecues, Precourt says he’s learned the importance of social interaction even though he sometimes misses others’ emotional cues. He believes, as do a number of autism activists, that the autistic brain may be the vanguard of a higher form of human evolution. The autistic personality of intensity, focused interests and little need for emotional attachment is tailor-made for a digital age where people work with devices rather than each other, he says. As for Trowbridge, he tries to dodge the brickbats flying back and forth between various autism groups fighting over causes and cures. This story is a part of The Palm Beach Post‘s premium content, and is available to subscribers only.